(Seychelles News Agency) - Government officials and members of civil society from Seychelles are learning more about climate change in order to be better equipped to negotiate at international meetings following a training session last week. The group took part in the training on Friday aimed at familiarising participants with the basics of climate change diplomacy and building knowledge and skills for more effective negotiation. “The impact of climate change is becoming more apparent in Seychelles. As a small country, we continuously need support and make our voice heard internationally. 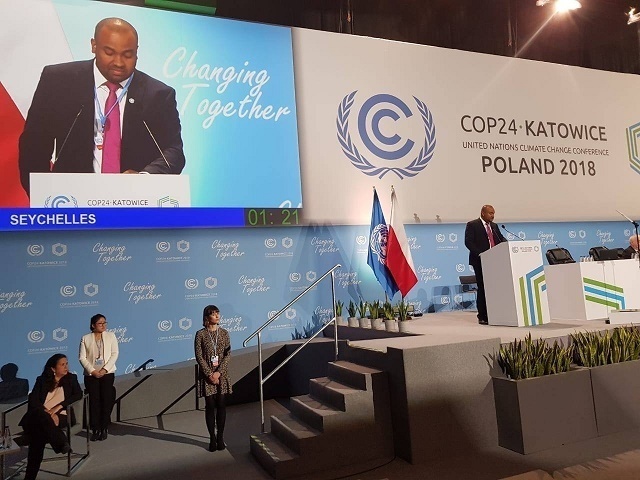 For that to happen those dealing with climate change have to be skilled in various areas such as advocacy and negotiation,” said Ronny Jumeau, Seychelles' permanent representative to the United Nations. Jumeau said that an important factor that negotiators need to take into account when they attend international climate change meeting is how to get access to financing. “Now that Seychelles has become a high-income country it is more difficult to get access to finance to support local climate change adaptation projects. Therefore, negotiators need to be skilful and know what they are talking about to lure donors,” he said. Climate change is adversely affecting the economic development of Seychelles, an archipelago in the western Indian Ocean. This is having a direct impact on the livelihoods of the islanders, and getting access to finances is vital to the island nation’s survival. The workshop comes right after a capacity needs assessment recently completed by the Global Climate Change Alliance Plus Initiative (GCCA+) programme in which the need for strengthening the knowledge and skills of Seychellois climate change negotiators was identified. Some of the participants in the workshop had already attended the Conference of the Parties (COP) meetings and those who will be attending the next meeting wanted to be better prepared.